Benjamin Gorman will be signing books at booth 39 at the Portland Book Festival on November 10th. Benjamin Gorman teaches high school English in Independence, Oregon, where he lives with his beautiful, smart, and infinitely patient wife, Paige, and their essentially perfect son, Noah. Paige and and Benjamin are to co-publishers at Not a Pipe Publishing. 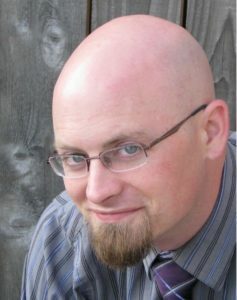 Benjamin is the author of The Sum of Our Gods, Corporate High School, and The Digital Storm: A Science Fiction Reimagining of William Shakespeare’s The Tempest. Corporate High School is an Amazon bestseller. The Digital Storm was nominated for a Pulitzer and was selected as a Top Five Book Pick of 2018 by the San Diego Union Tribune. Joe has been cursed. He must meet with God for coffee weekly. Yahweh is a crotchety old deity with a pantheon of family problems. Though God doesn’t seem to care about human concerns, Joe’s mortal life isn’t perfect, either. 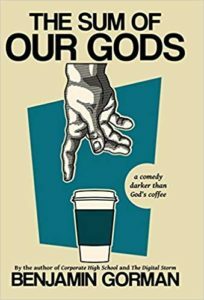 In fact, it’s a comedy as black as God’s coffee.